Governors are struggling in the 2016 presidential race: Why Americans are favoring senators and non-politicians for president. Why Are Governors Having Such a Hard Time? Americans used to think governors made good presidents. What happened? Ohio Gov. 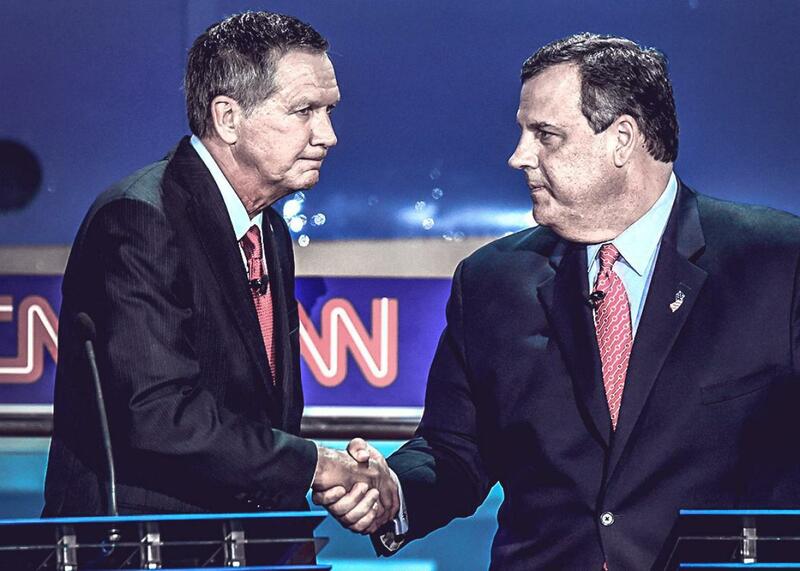 John Kasich shakes hands with New Jersey Gov. Chris Christie during the presidential debate in Simi Valley, California, on Sept. 16, 2015. Photo illustration by Juliana Jiménez. Photo by Frederic J. Brown. For several decades, Americans chose former governors to become their presidents. Think Jimmy Carter, Ronald Reagan, Bill Clinton, and George W. Bush. They ran as outsiders to the Washington, D.C. cesspool who could scale their ability to “get things done” up to the federal level, which is perennially dominated by a bunch of corrupt jibber-jabbering clowns. Governors, by their telling, have the precise sort of strong, Christian personal values that would scare the dickens out of all those cigar-chomping, God-killing lobbyists in the Beltway. But the 2016 cycle is the first in recent memory in which service as a governor seems to be more of a liability than an asset. As the Washington Post writes Thursday, the eight-person Republican debate field Tuesday night featured only one sitting governor: Ohio Gov. John Kasich, a well-pedigreed executive representing a critical swing state who, for whatever reason, spent much of the debate successfully going out of his way to irritate the Republican voting base. The “undercard” debate featured two sitting governors, Chris Christie and Bobby Jindal, and one ex-governor, Mike Huckabee. Another sitting governor, Scott Walker, has already exited the race, as has former Texas Gov. Rick Perry. You also may have noticed that ex-Gov. Jeb Bush is struggling in his bid for president and, as a technical matter, we are compelled to note that ex-Govs. Jim Gilmore and George Pataki remain in the presidential contest. On the Democratic side, ex-Gov. Lincoln Chafee has already filed out of the race, while accomplished and polished former Maryland Gov. Martin O’Malley is mired in the low single-digits just about everywhere. Senators, meanwhile, are all the rage. Barack Obama broke the long reign of governors and vice presidents when he became the first sitting senator since John F. Kennedy to be elected president. Hillary Clinton is an ex-senator, and her chief rival, Bernie Sanders, is a sitting senator. The two Republicans whom pundits are now favoring are first-term Sens. Marco Rubio and Ted Cruz, while Sen. Rand Paul put on an impressive display in Tuesday’s debate. Voters hate Washington, voters hate Congress, voters hate elites, and voters hate backroom deals made by elites. For some reason, though, they sure do get excited about members of the one body in the country that represents all of this: the United States Senate, our do-nothing ersatz House of Lords. What’s happened here? Why has the “I am an outsider with a record of accomplishments” argument gone from potent to meh? The Post calls out what’s surely one of the major factors: Governors, by nature of their positions as executives, have to make compromises in order to keep their states functioning, whereas senators mostly give grandstanding speeches and introduce phony “messaging” amendments all day. In a political environment that demands more and more purity out if its candidates for president, opposition researchers can have field days with the compromises that governors have signed over the years. The Senate, meanwhile, only passes viable legislation one or two times per millennium; the rest of that time is devoted to speaking, fundraising, and greeting constituents at college football tailgates. The pressure to vote for anything is especially lessened among this crop of Republican senators because their party does not control the White House, so there’s no president strong-arming them for support on compromise legislation. Indeed, there are real penalties for those naive silly-billies who do try to craft realistic legislation during their terms as legislators. Consider the utterly predictable and likely potent strategy that Cruz has begun to deploy against Rubio. Rubio, by nature of his sheer political skill, has managed to recoup much of the conservative capital he lost by trying to pass a balanced piece of legislation on comprehensive immigration reform. There’s no question, though, that he would have been better served had he, like Cruz, never attempted to pass something of value. But that can’t be the entire story. These vulnerabilities for governors and advantages for senators have existed for some time, even if disdain for compromise among partisans has reached soaring new vistas in contemporary politics. Besides, candidates like Walker, Bush, Jindal, and O’Malley haven’t fared poorly because of their records as governors, which are widely understood to be ideologically in line. It may just be that governor no longer corresponds directly with outsider, while the outsider label itself remains potent; similarly, senator no longer corresponds directly with insider. For all the railing against Washington, D.C., it’s now perfectly reasonable for a senator to portray him or herself as an outsider since congressional leaders have less ability to corral their members into staying in line. Candidates like Sanders and Cruz can credibly argue that they’re consummate “outsiders,” since they draw their power from funding streams independent from the party structure and don’t answer to any corrupt, pot-bellied establishment fat cats on the Hill. More obviously—on the Republican side, at least—is that certain candidates have upped the ante in terms of what constitutes an outsider. Donald Trump and Ben Carson are pure political outsiders, in that this is their first time running for office, and they seem to only get stronger by saying ludicrous things that they can spin as “outside-the-box.” Next to Trump and Carson, Walker and Perry looked less like outsiders and more like standard politicians. Which isn’t such a bad thing. The governor-as-outsider construct had a good, long run, but it was always pretty bogus. The Washington party establishments were frequently the ones propping up these candidates and thought that calling them “outsiders” would be a funny way to trick the voters into supporting them. And it’s not like governors are precious snowflakes who’ve never engaged in political corruption, either. Add up all the corruption in Washington over the last decade and it’s probably nothing compared to what goes on in your average state capital on any given day. Lastly, there’s nothing quite like the spotlight of the national media, shredding you to pieces for fun and games, 24/7, before tens or hundreds of millions of readers and viewers. Federal officeholders are more accustomed the media’s (our!) sadistic practices. Figures like Trump and Carly Fiorina have been managing life in the national spotlight for decades. Walker, Bush, and Perry have not. You probably noticed.